Andersen’s responsible way of using wood is a part of their company culture. In 1991 Andersen developed Fibrex® material, a novel composite made of reclaimed wood fiber from manufacturing operations and a special thermoplastic polymer, some of which is also reclaimed. The revolutionary and highly sustainable material has many benefits, including high durability, stiffness, moisture and heat resistance, non-conductivity and thermal insulating properties. Fusion installs Andersen® products for residential entry doors as well as folding, hinged and sliding patio doors. These energy efficient options are also sturdy and reliable. They are easy to install, meaning we can be in and out of a job in no time. Since 1903 Andersen Window and Doors has been in business. Today, they are known as, “America’s premier window manufacturer”. One piece to their success has been their high quality doors. With Andersen you will find a secure, energy-effiecnt and stunning door, right for any home. Just like with Andersen windows, you will find a huge selection of replacement doors or doors or a new home. Choose between different styles, materials, colors and different series. You will feel safe sleeping behind an Anderson door. 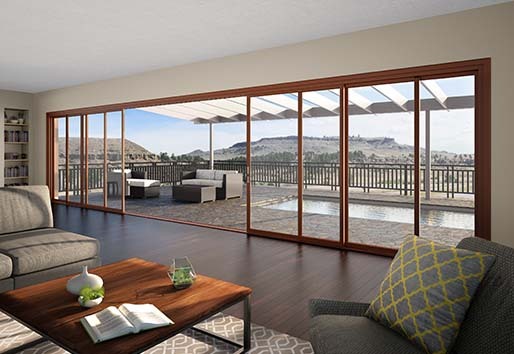 Take their hinged patio doors, for example, they come with multi-point locking system. They have also teamed up with Honeywell, a leading residential security system provider. Together they have created the VeriLock® integrated security sensors. Fusion Windows and Doors is proud to be a certified Andersen door installer and dealer. Contact us if you are interested in getting Andersen replacement doors installed. Read below to learn more about Andersen doors. A-Series products from the Architectural Collection provide the variety and options you need to achieve virtually any architectural style with true authenticity. The doors in this series were designed in conjunction with leading architects to ensure each is authentic to the architectural style you select. Andersen® 400 Series doors provide a classic blend of engineering and craftsmanship, featuring extensive sizes, shapes, styles and colors. We design each product to meet our demanding standards. And each is available with a full array of options and accessories. Andersen® has teamed up with Honeywell, a leading residential security system provider, to create a revolutionary product in home security: VeriLock® integrated security sensors. With VeriLock sensors, all it takes is a quick glance at the security system keypad* to know if your home is secured, day or night.